(PRLEAP.COM) March 21, 2019 - Park City, UT – Janco Associates, Inc. – Janco Associates Inc. (www.e-janco.com) has just released a major update to its Compliance Management Kit. The CEO of Janco Associates, Mr. M.V. Janulaitis said: "CIOs know that changes in privacy and security mandates are happening so rapidly they have limited ability to be proactive. With the ever-increasing reliance on the Internet and electronic communication being a larger component of enterprise's relationships with their clients, privacy and security compliance are more critical." The CEO added, "The Compliance Management Kit address these issues directly." The kit comes in three version – Silver, Gold, and Platinum. All the versions are available either with 12 or 24 months of update service. With the update service, Janco's clients can they will have the tools necessary to meet all mandated requirements. Silver Edition with the Compliance Management White Paper, a self-scoring Security Audit, a PCI Audit Program, and 31 key Job Descriptions including Chief Security Officer (CSO). Gold Edition includes everything in the Silver Edition plus a Record Classification and Management Policy and a Privacy Compliance Policy with a detail implementation work plan. Janulaitis said, "Each component in the kit has been reviewed and updated within the last 90 days and meet the latest mandates. In addition, the firm has looked ahead at proposed legislation and addressed many of the issues impacting privacy and security." He also said, "With this offering, Janco has balanced enterprise operational needs, with legal record retention and disposition requirements, and privacy mandates for both GDPR (EU) and the CaCPA (California Privacy Legislation) in a workable cost-effective solution. This offering and tools provided are discussed on Janco's web site (https://www.e-janco.com/compliance.htm. 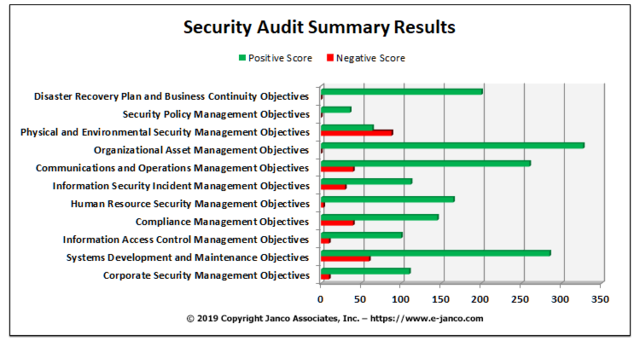 One example of the tools provided is the Self-Scoring Security Audit Program that quickly produces a graphic that does highlight operational and compliance risks. All of Janco's products are delivered electronically in formats that are easily customizable by the user. Janulaitis said, "We have clients in over 100 countries that rely on the leading edge work that we deliver. We will continue to be at the forefront of infrastructure management as that is the strength of our company and its offerings." Janco is an international consulting firm that follows issues that concerns CIOs and CFOs and publishes a series of IT and business infrastructure HandiGuides® and Templates including a Disaster Recovery/Business Continuity Template, Security Template, and IT Salary Survey.